Burning off vacation. Working weekends, I tend to hang on to my vacation day in case something comes up where I need to take a Saturday off. You know…all you 9 to 5ers can make plans on a Saturday or attend a wedding or a birthday party or go to a ballgame without having to use vacation. Those are the annoying things about working weekends. So, anyway, I hang to days just in case and come December, I end up with a few leftover. I actually had three going in to the final month of the year and they don’t carry over so I needed to burn some days. For no particular reason, I took a Friday and Saturday off while J took the following Monday, Tuesday, Wednesday off and we do what we always do on long weekends…..we head home to our parents houses. First up was my parents. We got in to town Friday night and stayed through Saturday evening. As I’ve mentioned before, I grew up in a really small town and in really small towns, there aren’t a lot of dining options. New since I moved away is a Subway, but that’s it other than a family restaurant near the Interstate and a pizza place with weird hours. On Saturday afternoon, we were hanging out at my brother’s house and I started getting hungry. J had mentioned she was hungry as well, so I finally just said I was ordering a couple pizzas. The closest pizza place is about twenty minutes away, but I was fine with the drive. I really just wanted some food. Monical’s Pizza is THE local pizza joint. They have several locations spread throughout the region…and by several I mean 65. 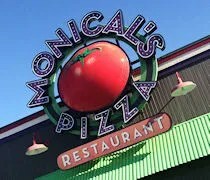 Growing up, Monical’s was always the pizza place my brother and dad preferred. 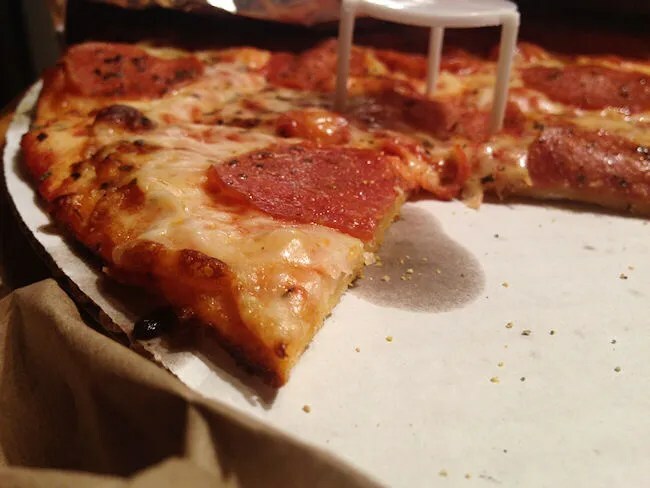 I always wanted to go to Pizza Hut because I liked their bread sticks better, but as I got older and wiser, I came around to Monical’s cracker thin crust pizza. The Monical’s we always went to closed down several years ago, but there are still at least two in the Kankakee area. The closest one to where my brother lives is on West Court Street in the City of Kankakee just to the west of the Kankakee River. I started putting an order in on my phone when J and my Sister-In-Law started making fun of me for using online ordering. SIL said she had coupons and she would just call the order in. I gave in and let them do what they wanted as long as someone put in an order for a pizza. We ordered a Family Pleaser which is 16″ Thin Crust Pizza (we got half pepperoni and half sausage), a Family Chef Salad, and a two liter of pop. We tacked on bread sticks and a 14″ pizza with just cheese for the kids and J. Once the order was placed, my mom and I got in the car and headed north. After a quick stop at the Circle K to pick up some pop, I walked in the door just as my pizzas were being wrapped up. The total was right at $40…which is funny, because I had the exact same order for $5 cheaper ordering online because I got a coupon for signing up for an account…who’s making fun of my online ordering now? Everyone was ready to eat when Mom and I got back to my brother’s. Before we even got the pizzas down on the table, I was ripping in to the paper wrapping to get the pizza out. When I say this pizza is cracker thin, I actually mean it’s cracker thin. I don’t know how they do it, but this is the thinest pizza I’ve ever eaten anyway. The pizza is cut in to tiny squares and despite its thinness, the crust is a perfect balance between crispy and chewy. After polishing off a few slices of pizza, the next thing I reached for were the bread sticks. 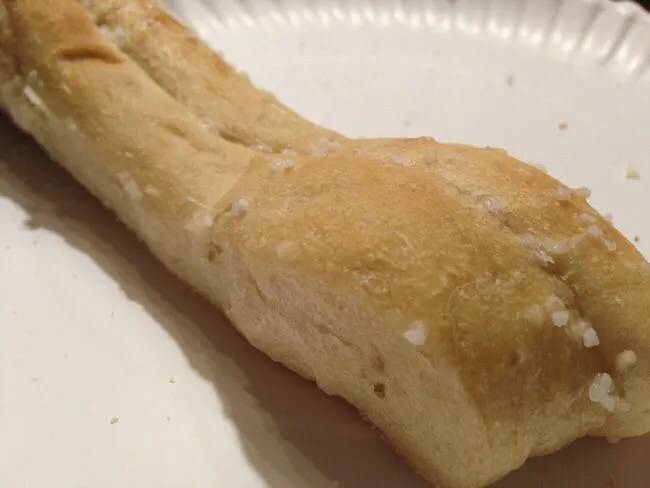 The bread sticks are rather large and rather doughy. They’re topped with a sprinkling of of salt and served with choice of two dipping sauces. We always choose the marinara and the nacho cheese. The salad is really the surprising part of Monical’s. Now, the salad itself is really nothing special. It’s iceberg lettuce with shredded cheese, carrot shreds and tomatoes. The surprising part is the salad dressing. The Sweet and Tart Dressing is Monical’s signature flavor. I hate to admit it, but I know people who used to steal the bottle off the table after the meal just to bring this delicious flavor home. Now, they actually sell the dressing so you don’t have to risk it anymore. 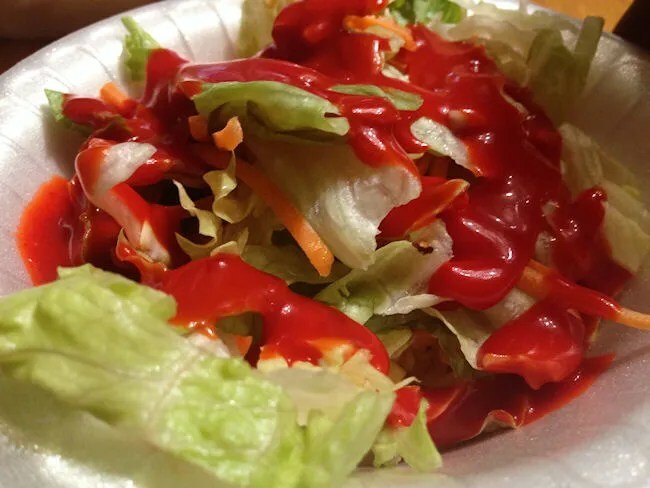 The thing about the dressing is most people use it for more than just the salad. I was always the weird one and never dipped my pizza in it, but that has always been the thing to do. Even J picked up on that after our last trip to Monical’s and I was surprised to see her doing it along with everyone else at the table. Is Monical’s the best pizza in the world? No…but it’s a part of my childhood that I look back on fondly. The pizza is delicious and it’s not like any other pizza you’re going to get anywhere else. It’s slightly expensive for what it is. Even the lightest eater can finish of a 16″ thin crust pretty easily, so it helps if you go with some sides. 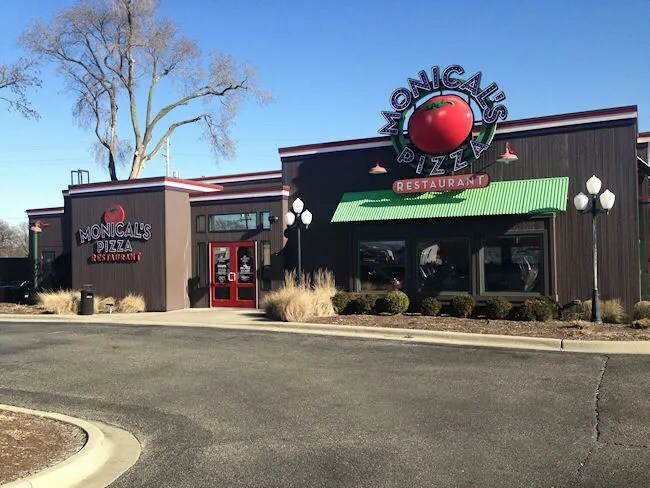 Unfortunately, Monical’s of Monticello (IN) is the closet location to Kalamazoo, but if you’re ever driving through Illinois, keep your eyes peeled for this little piece of Central Illinois legend.